An insatiable demand for content appears to be all the rage these days. But you can’t figure out if the content you’re providing is actually what they’re asking for? If that’s not enough, you’re flummoxed to see the plethora of content that’s already on the web, making you wonder if your content is going to matter at all, or if the right people will even see it? Owing to all these predicaments, marketers have started carefully mapping their content marketing to their business plans. Still, it’s one thing to have a plan, and another to apply it. Delineated in this article are the must have six content marketing habits that are sure to help you increase traffic and get you better return on investment. Read on to gain an expert insight on content marketing. Automation is perhaps the biggest trend in Content Marketing for 2016. Internet technology with its powerful web services and mobile applications makes it possible to automate marketing strategies, saving you precious time and resources by posting to your website and social media on a pre-determined schedule. Popular ad services such as Google AdSense and Amazon Associates even allow you to automate advertising space on your website.Distributing your content across multiple platforms has just got easier with automation tools. But duplicating content can adversely affect your website’s ability to generate revenue from ads. For instance, Tumblr offers a “reblog” feature, wherein anyone could publish an exact copy of another different user’s post on their own Tumblr blog. Although this feature is great for sharing relevant content with your followers, it does bring some copyright issues to the fore, especially in cases where you plan to monetize your website through ad revenue. Google AdSense policies explicitly prohibit displaying ads alongside copyrighted material that one doesn’t have authorization to use.Curata offers a fine set of tools for automating content generation and marketing. Furthermore, Content Distribution to a variety of services viz. WordPress and MailChimp, is simplified by Spokal‘s inbound marketing platform. ClearVoice, by specializing in content collaboration and workflow automation, presents a unique content studio along with flexible workflow software with a built-in marketplace that brings branding, content creation and publishing communities all in one place while meeting your budget, timeline and voice at the same time. Introduced in 2012, Google’s Knowledge Graph brings up instant answers directly through its search engine service. Google Now, Siri and Cortana employ similar technologies to create content-based answers. Users won’t bother clicking on the links in search results and visiting the website if their questions are answered promptly by the search engine itself. Traffic to websites, to put it mildly, is trivial – content is likely to dwindle in 2016, thereby placing greater emphasis on the value of complicated niche topics. Pinpointing your business’s target market is crucial as it helps you tailor complex topics that your audience cares about. Instead of cramming your blog with generic SEO content and keywords, make a niche site and add value to it by using authoritative and informational content. Excedrin epitomizes this approach; being the winner of the 2015 Content Marketing Awards for Best Content Marketing Program Strategy, it created a comprehensive website that was tailored to address the headache-relief needs of its target market. The pain-relief brand employs educational resources, email, banners, social media and videos to form a highly effective, media-rich content hub. Multimedia content plays a key role in defining your company’s credibility. For instance, your target audience is more likely to grasp onto information when it’s imparted through some kind of visual medium. As per a recent survey by Animoto, “71 percent of consumers asserted that videos leave a positive impression of a company.” Furthermore, Cisco estimates that 70% of internet traffic will be made up of online videos by 2017. Infographics are really effective visual mediums your business can take advantage of to explain complex processes, facts and statistics. 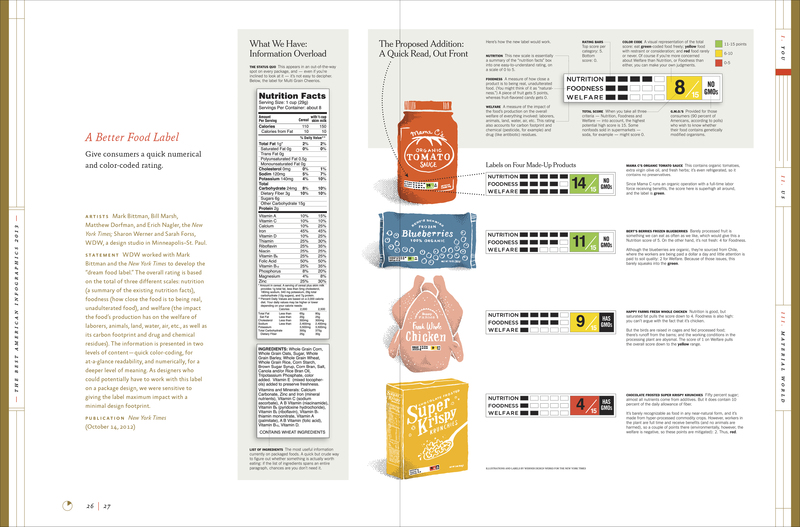 This infographic, which appeared in the New York Times is the best illustration of easily-digestible visual alternative to the standard nutrition-fact labels that are found on food products. Incorporating surveys, polls or games in your content can immensely increase user engagement with your brand. 4) Quality over Quantity The internet is flooded with content, making it harder for users to find authoritative and credible content providers. To set yourself apart from the rest, showcase the best you’ve got to offer in your content. Instead of publishing five bog-standard posts on your blog each week, consider vetting three of four esoteric subjects providing realistic solutions for your target market. Ascertain the minimum quantity of content your website needs to attain maximum results without impinging on the quality in any way. Google recommends creating “unique, specific and high quality” content to gain a competitive edge against other websites. Stay clear of publishing misinformation or broken links to other web pages. Content should be correct and not have typos, grammar or spelling mistakes. A surplus of ads and comment spam could also adversely affect the perceived content-quality. 5) Leverage a network of influencers Influencer-marketing appears to have become the norm in the sphere of content-marketing nowadays. Companies take the help of illustrious individuals to increase market awareness through their personal network of followers. Social media is a powerful tool to fulfil that purpose. Much like word of mouth marketing, influencer marketing has the potential to affect the decision making process of consumers. Determining the most relevant influencers for your niche can prove to be a bit challenging at first, but there are a variety of web services that can help you engage with the right influencers for your business such as InNetwork, Traackr and TapInfluence. LinkedIn is a great resource for identifying influential people already within your network. 6) Algorithms and artificial intelligence Artificial Intelligence has come a long way since its inception. In 2016, you’re very likely to stumble on to at least one news article that’s generated by a computer algorithm rather than a real person. While freelancers still remain the most cost-effective approach for content generation, the advent of artificial intelligence has begun to significantly impact this strategy. Data-driven topics such as weather forecasts and sports coverage act as the mining field for these computer generated articles. Only last year, Associated Press disclosed its use of software to automatically generate new content for college sports games. Automated Insights‘ Wordsmith is one of the most popular content generation tools. GameChanger, an exciting iPhone app developed by Narrative Science, streams out millions of sport recaps annually such as Little League games by using advanced computer algorithms. Staying on top of the latest trends in content marketing provides you with the all-important knowledge your business needs to survive the cut-throat challenge in the market. The most recent developments of web-based marketing services render it possible for businesses to get in touch with more potential customers without spending a great deal of money. Take note of the 6 habits and other latest trends covered in this article, as you go about implementing the new content marketing strategies in 2016. This entry was posted in Content Marketing, Marketing, Marketing Automation, Marketing Plans, Targeting and tagged B2B content marketing, content marketing, website marketing. Bookmark the permalink. I totally agree that sourcing relevant influencers can be a tedious tasks, especially if you don’t have the right experience for it. We’ve used ROI Influencer Media service in the past – https://roiinfluencer.com/ – and it made our lives easier in so many ways. My point is, relying on professional influencer agency helps make the process smoother and more efficient.